Don’t dismiss Intel’s newest CPU with a meh just yet. There’s more to the chip than you expect. Intel’s Tuesday rollout of 7th-generation Kaby Lake CPU for desktops has met a dubious fanfare of leaked reviews that dismiss the new chip as one huge Core i Yawn. Kaby Lake seems to offer barely any movement forward and when overclocked, apparently gets to nuclear-fusion levels of heat output. But it's too early to write off Kaby Lake. There’s a lot more to it that you still need to know. Little-known fact: Kaby Lake gets the “7th gen” name because of the improved graphics core and video engine, while the x86 cores are essentially unchanged. Kaby Lake launched in August with dual-core versions for laptops that offered reasonable performance upticks. The highlight is its video engine, which can handle 10-bit content without breaking a sweat. Play a 10-bit color depth file on a Skylake laptop with integrated graphics, and you drop frames and destroy battery life. The same video on Kaby Lake hums along with far less impact. You can see this demonstrated right here. The updated graphics core with the latest content protection can now stream 4K from services such as Netflix.com. Kaby Lake is the first K chip that seems able to hit 5GHz in several generations. On the desktop side, however, power users don’t care about integrated graphics, focusing more on the lackluster x86 performance.To be fair, Intel set the expectation in August that Kaby Lake was basically Skylake on an improved process that squeezes out more megahertz. For example, the top-end Core i7-7700K has a base clock of 4.2GHz and a Turbo Boost clock speed of 4.5GHz, vs. a Skylake Core i7-6700K’s base clock of 4GHz and Turbo Boost of 4.2GHz. The cache size, the core count, the memory controller and even the same LGA1151 socket are unchanged from the previous chip. Intel’s “S-series” compromises its desktop lineup of new Kaby Lake-based Core CPUs. Intel fleshes out the Kaby Lake lineup with a total of 42 CPUs: 17 ultra low power chips for laptops, two quad-core Xeons, seven quad-core laptop CPUs, and 16 desktop CPUs. Of particular interest in that desktop lineup to DIYers are the three unlocked “K” chips. 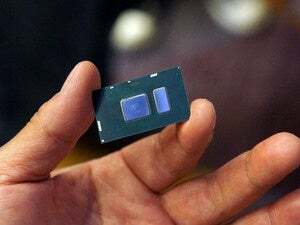 The first two were expected: a quad-core with 4.2GHz Core i7-7700K with Hyper-Threading and a quad-core 3.8GHz Core i5-7600K without Hyper-Threading. 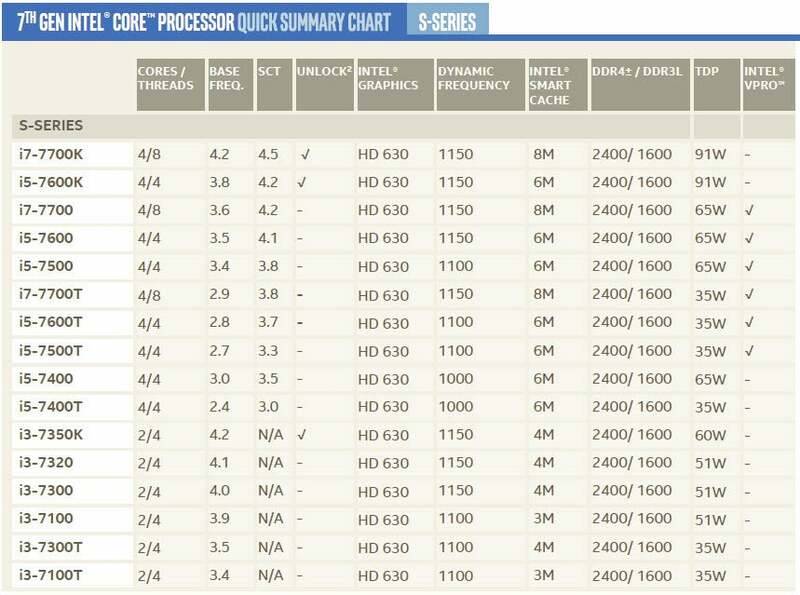 The third is a surprise: the dual-core 4.2GHz Core i3-7350K. The CPU has Hyper-Threading but since it is a Core i3, does not have Turbo Boost enabled. 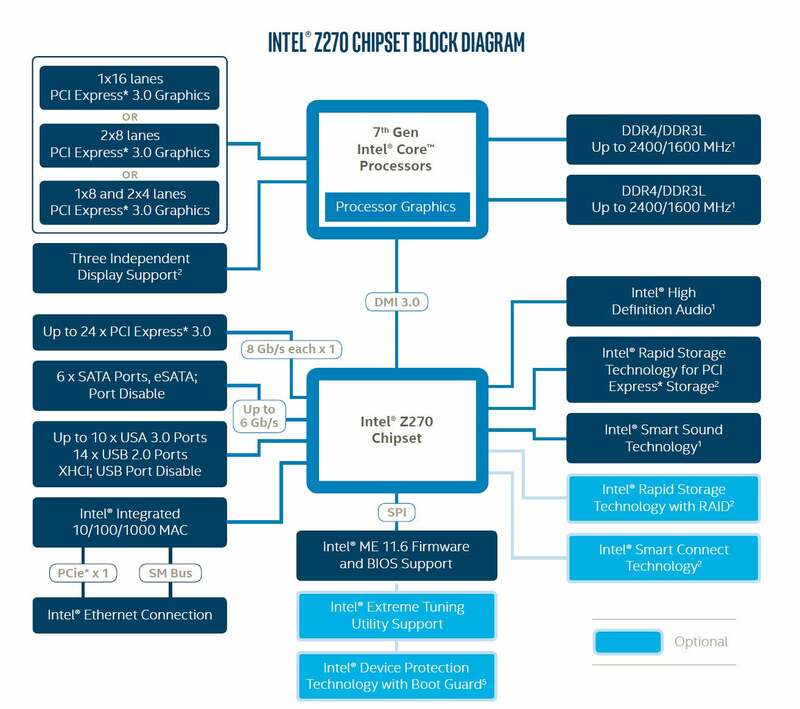 This isn’t Intel's first "budget" overclocking chips though. 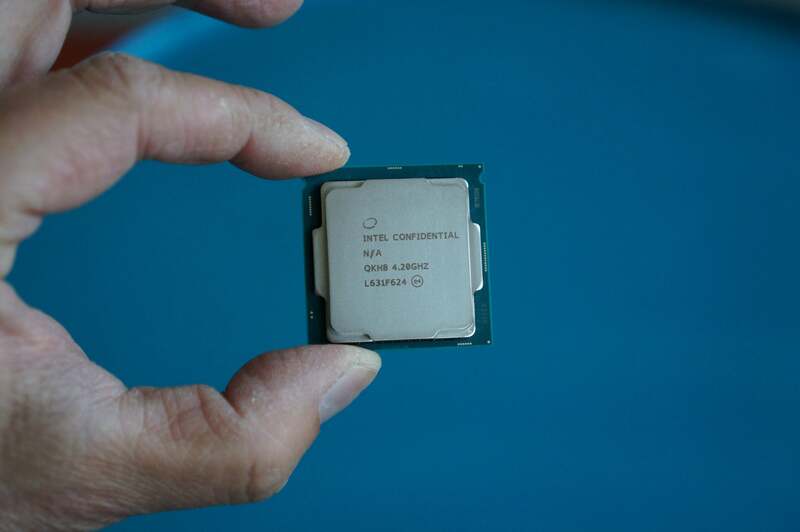 The company introduced the dual-core Pentium G3258 Anniversary Edition in 2014 and as early as 2010, Intel sold the dual-core Core i5-655K. 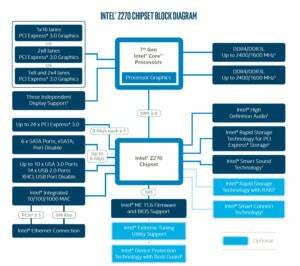 The Z270 is the first “Optane-ready” chipset from Intel. We just don’t know what exactly that means just yet. 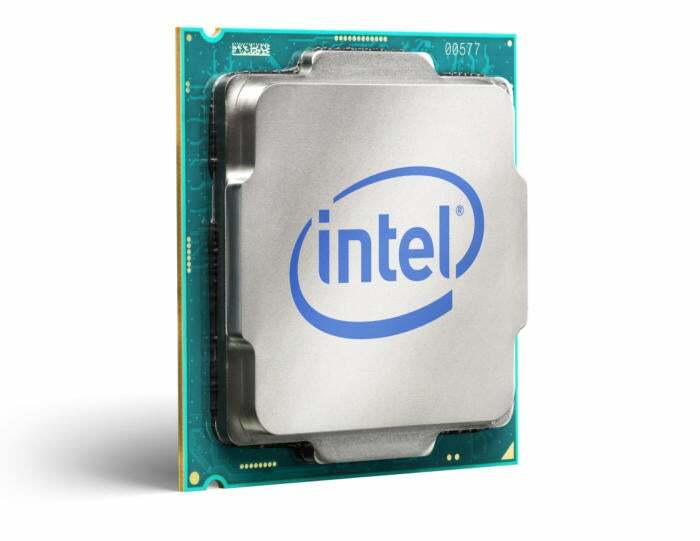 With Kaby Lake for desktops, Intel is introducing new 200-series chipsets to replace the 100-series chipsets that was introduced with Skylake. Like Kaby Lake, it is an incremental update that disappoints a bit. We expected the 200-series chipsets to feature native support for USB 3.1 10Gbps or maybe even Thunderbolt 3, but no. Instead, motherboard makers will have to add additional chips for those functions. The Z170 chipset was a big step forward for mainstream motherboard chipsets and Z270 inches it a little bit father forward. From what I can tell, there are three key changes to Z270. The first is an upgrade from the 20 lanes of PCIe Gen 3 in the Z170 to 24 lanes in the new performance Z270 chipset. The move will let motherboard makers integrate high-bandwidth connections such as M.2 or U.2 without having to share bandwidth between devices. 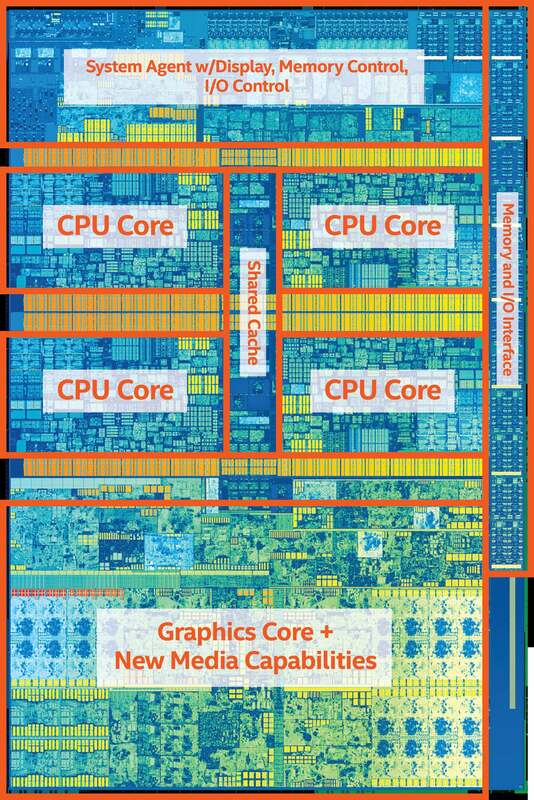 Intel says it has also improved overclocking capability. The last upgrade is official “Optane ready” support. 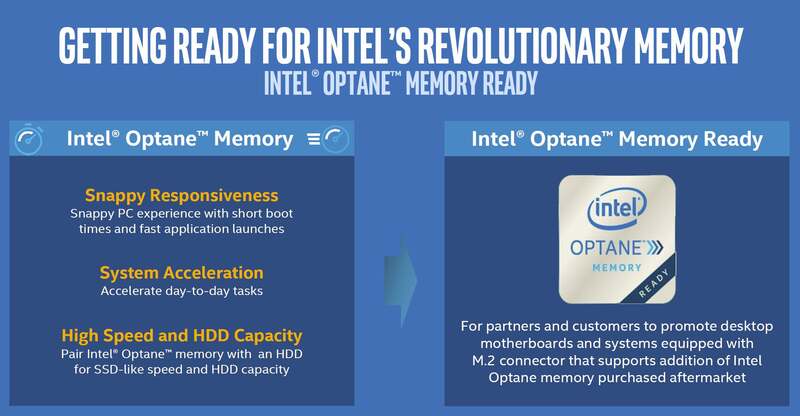 What that means isn’t exactly clear, but we do know Intel’s Optane (a non-volatile memory that promises much higher performance than SSDs) will go into an M.2 slot on the board, where it can be used as a traditional storage device or as a way to accelerate system performance, much like what's done today with Intel’s Smart Response Technology, which uses an SSD to cache performance from a traditional hard drive. That doesn’t mean Optane won’t work in other systems using older chipsets, but Intel is likely to support it only for “system acceleration” on Z270 initially. If none of these sound like much of an upgrade over your existing Z170 motherboard, the good news is you don’t have to buy a Z270 motherboard. Kaby Lake drops into most LGA1151 Z170 motherboards and works just fine, as long as you're using an updated BIOS that supports the new CPU. 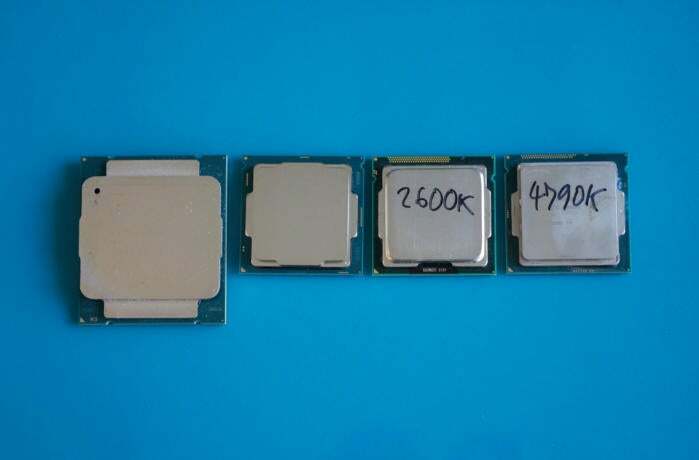 From left to right: An 8-core Core i7-5960X, the new Core i7-7700K, the ancient Core i7-2600K and a Core i7-4790K. For our performance testing, I focused on how Kaby Lake does against the CPU it replaces: I dropped the Core i7-7700K into the same Asus Z170 Deluxe motherboard that the Skylake chip was first tested with. The CPU was cooled with a Corsair H80i closed liquid cooler and outfitted with 16GB of Corsair DDR4/2133 RAM, a reference GeForce GTX 980 card and a 256GB HyperX SSD. The OS was Windows 10 running the TH2 build. 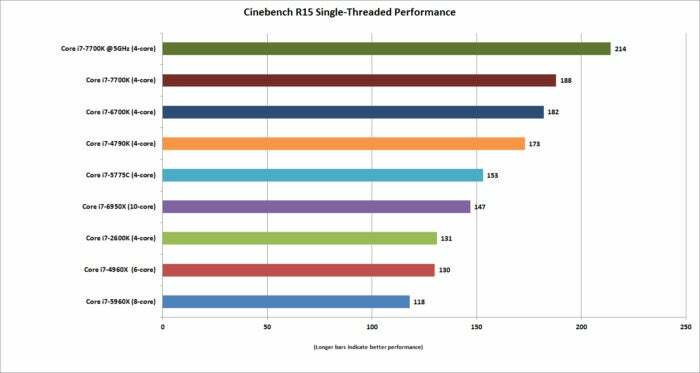 Cinebench R15 puts the new Core i7-7700K at the top of the heap for main stream quad-core chips. Our first test is Maxon’s Cinebench R15. 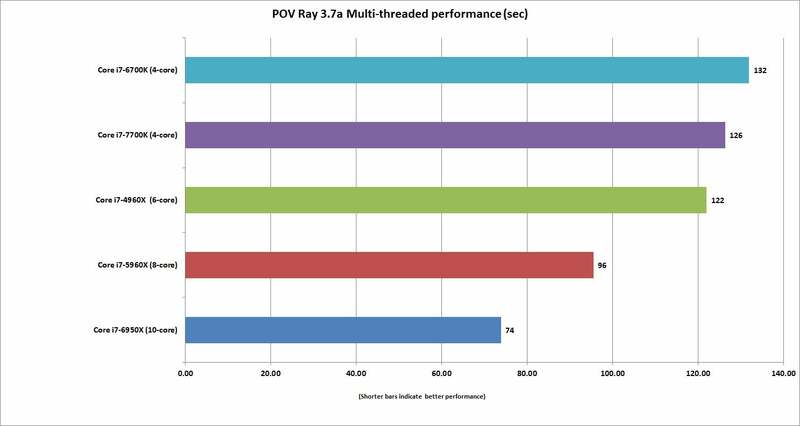 It’s a benchmark based on Maxon’s professional Cinema4D rendering engine and is a pure CPU test. We recorded scores from many of Intel’s high-end quad-core mainstream chips, as well as chips with more cores for context. Among the quad-cores, the Core i7-7700K the winner by the expected amount. The Kaby Lake CPU is roughly 4 to 5 percent higher in clock speed and roughly 4 to 5 percent faster in Cinebench. When you look back to the Core i7-2600K though, it’s a huge 42-percent difference in performance. Stock clock performance between the Kaby Lake, Skylake and Devil’s Canyon, though, isn’t exactly going to set the world on fire. When run in single-threaded mode, Cinebench R15 shows a high clocked, more efficient core is the way to go. One error with focusing exclusively on multi-core performance is reality doesn’t match that. The vast majority of applications are lucky to exploit more than a single thread, instead favoring higher clock speeds and more efficient CPU cores. 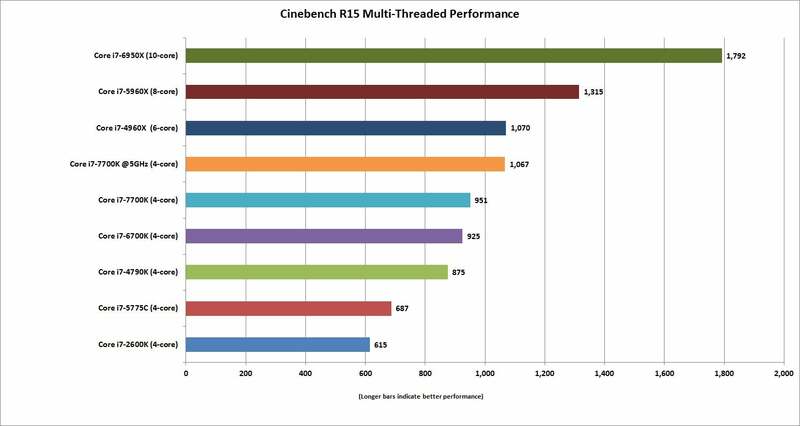 Once we set Cinebench R15 to run in single-threaded mode, the quad-cores with their higher clock speeds jump to the front of the line, with the Core i7-7700K now leading the pack. For most people, who don’t do 3D rendering or other heavily multi-threaded tasks, a quad-core with higher clock speeds is the right choice. Other highlights from the results: There isn’t a lot daylight between the Core i7-7700K and the Core i7-6700K. Note, too, that our 10-core Broadwell-E Core i7-6950X was performed without Turbo Boost Max. Turbo Boost Max lets the CPU greatly increase the clock speed on a single core, bringing performance a lot closer to the quad-cores. POV Ray mostly matches our results form Cinebench R15. The Kaby Lake chip wins eases out in front of the Skyale chip but it’s not a game changer. 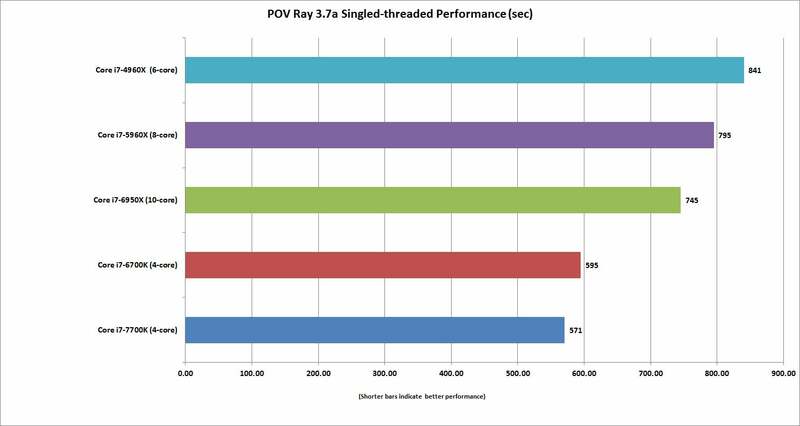 Another CPU-heavy test we use is POV Ray. It’s a ray-tracing program that traces its roots back to the Amiga. Our benchmark set is a little smaller but no surprise, the Kaby Lake, with its 4- to 5-percent clock speed advantage, finishes the test about 4 to 5 percent faster, putting the Core i7-7700K just barely behind a six-core Ivy Bridge-E Core i7-4960X. Just like with Cinebench, when you run on a single core, the higher frequency chips win. As with Cinebench R15, we also run the test using a single-threaded workload. With lighter loads the CPUs can run at higher clock speeds and no surprise, the pair of quad-cores take the lead. Again, we saw maybe a 5 percent advantage for the Core i7-7700K over the Core i7-6700K.